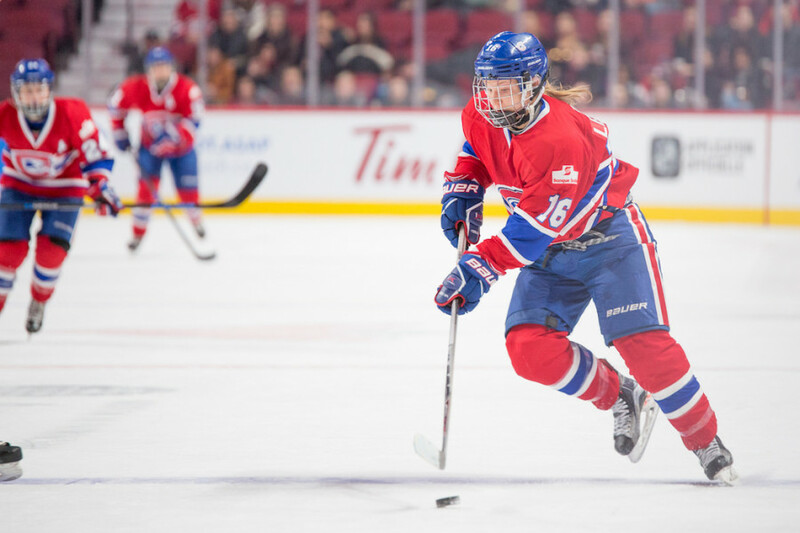 Since the Canadian Women’s Hockey League’s inception, no team has been more successful than Les Canadiennes de Montréal. Previously known as the Montreal Stars, the team has won four Clarkson Cups since 2009, a feat unmatched by any other team in the league. On Dec. 9, the team celebrated nearly a decade of success by raising the championship banners for their 2009, 2011, 2012, and 2017 Clarkson Cup victories. Ouellette had plenty of company to celebrate the momentous occasion with. Canadiennes and Stars alumni filled the Michel Normandin Arena to take part in the banner raising ceremony. As the lights went down before the game, players and alumni were preceded by recordings from their Clarkson Cup victories played over the loudspeaker. With the calls of the past dying down and a spotlight on the banners, each alumni that was introduced met a greater roar from the crowd than the last. Marin would also mark the occasion by scoring a hat trick against Toronto, becoming the second leading scorer in CWHL history. Perhaps the greatest cheer of all was saved for Concordia Stingers women’s hockey head coach and Les Canadiennes extended roster member, Julie Chu. She walked onto the ice with her newborn daughter Liv to cheers that would not be out of place in a crowd double the size of the one present at the arena. The team seemed to pick up on the energy from the ceremony, taking home a 7-3 victory and second place in the league standings overall.